The following is a guest post about debt. If interested in submitting a guest post please read my guest post policy and then contact me. It’s often said that the goal of successful personal finance management is achieved by spending less and saving more. That makes sense, but which comes first? If you have a set number of dollars to allocate each month, it’s challenging to decide whether you should first pay down existing debt or focus on building your personal savings. The advice given by many financial advisors today directs consumers to pay down debt before they ever think of trying to set aside money for savings, but that’s easy to say when you are living on a financial advisor’s salary. 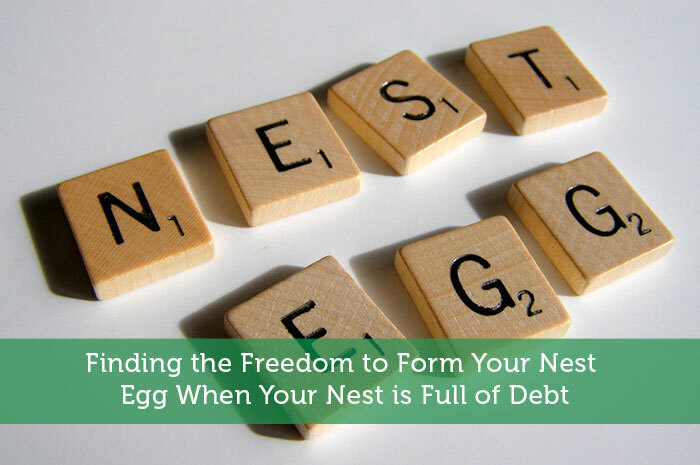 So, for the average American, which comes first: freedom from debt, or a nest egg? First, it’s important to point out that while freedom from debt may save you from paying mountains of interest, an “emergency fund” savings account could save you from total financial ruin. This is especially true in cases where you would go back and borrow against those revolving accounts again if you ever found yourself in a financial emergency. However, it is difficult to convince anyone to focus strictly on saving when these accounts are currently earning so little (at best, 2%) and revolving credit accounts are charging so much (in the neighborhood of 30%). There are advantages and disadvantages to either approach, so every person has to evaluate his/her own situation and decide what is best. Like most things in life, the best case scenario is that you find a way to evenly balance the two. If you are able to divide disposable income between saving and paying off debt, you’re likely to feel better about the process and be able to stick with the plan you have made for yourself. You will see slow and steady progress on the repayment of debt while simultaneously providing a cushion for yourself. This is also a great way to develop healthier financial habits. Once the debt has been repaid, you will have more money to spend on luxuries or be able to contribute more to your savings. The amount of money you allocate for each should be based on your own priorities and individual features of your revolving debt. For example, revolving accounts with higher interest rates should be given higher priority in your overall debt repayment plan. Also, you should take advantage of any opportunity to consolidate debt into a single account that offers a lower rate. Set measurable goals for yourself, but try to not dwell on progress too much. As the saying goes, “a watched pot never boils”. Don’t stare at your account balances each week and get discouraged. It’s best to stick to your plan, and check back for progress after a few months. You’ll be surprised at the difference you can make in a short amount of time. About the author: Marissa Kasarov studied Marketing and Management at City Colleges of Chicago and Project Management at Northwestern University. She is currently enrolled at Columbia College, studying Business Administration, and works as a business manager in the veterinary industry. Marissa is a staff writer for CollegeFocus, a website dedicated to helping students deal with the challenges of college, including housing, finance, style, health, relationships, and transferring from a community college to a four-year university. You can follow CollegeFocus on Twitter and Facebook. It seems like Dave Ramsey gets a lot of criticism in the financial blogger community but his approach to save $1000 in an emergency fund, then proceed with paying down debt makes a lot of sense. Years ago I paid every spare cent to paying down the credit cards, neglecting to save much. Then each time I’d think I was making progress, we needed to spend a substantial sum on a car repair or something like that. We had to put it right back on the credit card. If I’d had an e-fund, I could use that and then replenish it by making slightly smaller payments on the debt until savings recovered. I’d try to do both at the same time realizing it takes time for either balance to move. Having at least some emergency money is critical in my opinion, because answering a problem with credit cards is a quick way to backslide in your debt elimination strategy. At least save $500 or $1000 first! I think the key is balance. Having emergency fund is critical, but paying off debts can let you even put more money towards your emergency funds. I’ll personally prioritize paying off debts first and save only the bare minimum towards my emergency funds. I agree with you on having balance. I also think one should eliminate his or her debt first. I think it is important to have some savings for emergencies and then just focus on the debt. Most people who try to split between the 2 end up never getting out of debt and never savings anything because they aren’t using the money they are saving to save, they spend and the debt takes too long to pay off. I like that you used “a watched pot never boils”. That’s definitely true for investments. If you watch them every day, you will be disappointed and it may even be stressful! I think the bigger challenge is to stem the flow of overspending on day to day life, so that progress can be made. Yes, there will be hiccups, but what is the point of having $1000 sitting around if it’s costing you 30%? If you can go three months without using the $1000, it would have saved you $75 if you put it toward a 30% card. If you can go six months, that’s $150. Have a small cash buffer (say $200-$500), but much more than that and you are just shooting yourself in the foot. At some point, people who become debt-free decide that enough is enough. Their old lifestyle wasn’t working, and they’re ready to make some serious changes. It’s like they have a personality change, but that’s not what really happens. All they are doing is rediscovering aspects of their personality that have always been there. I am having a hard time finding the balance between savings and paying off my debt. I seem to go back and forth, month to month, of where to put my money. You should not hide from the debt and should check out your financial condition. I can understand that it is very easy to but you should calculate the damage and develop the strategies how to remove it. This article has such a simple premise but I enjoyed it. I have an issue with staring at my accounts every week expecting something big to happen when I know exactly what is coming in and going out. I definitely get impatient with how long it takes to pay down a balance or save a certain amount. We have found that having a savings has saved us many times. We work so hard over many months to pay down a credit card instead of putting some into savings and when a large expense comes up (it’s always the car), it drives that balance right back up and we’re stuck again. Establishing a savings routine has helped us tremendously without losing focus on our debt goals.